What’s the deal with games like Dungeons & Dragons and Pathfinder? What the heck even is a role-playing game? How do I get started? How should I run my first RPG session? I ran my first game; what did I do wrong? How do I get better? How can I be the best Game Master I can be? 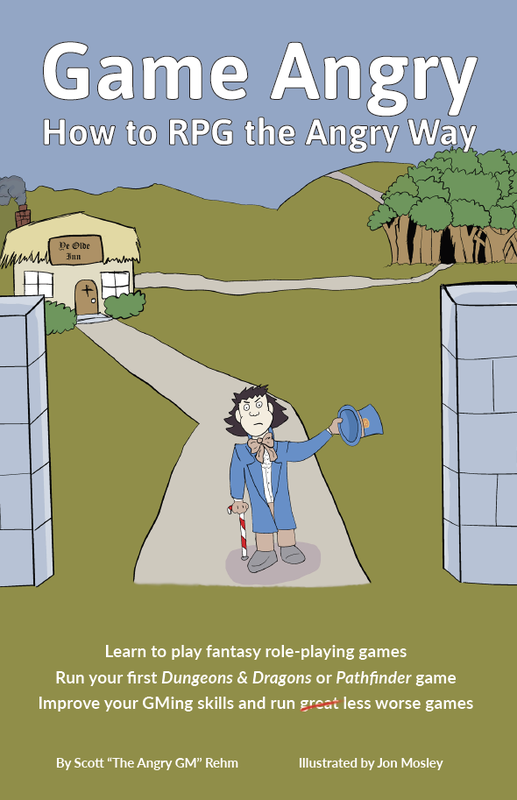 If you’ve ever asked any of those questions, Game Angry: How to RPG the Angry Way is for you. Whatever your level of experience, Game Angry has something for you. If you literally have no idea what those previous paragraphs were talking about with role-playing games and running sessions and things, The Angry GM will explain it. If you’ve been playing RPGs for a while and you’re ready to take the reigns and run your own game, The Angry GM will tell you how. And if you’ve been running games for years, The Angry GM will tell you everything you’ve been doing wrong, so you can do it better. Just be warned that The Angry GM won’t pull any punches. He’ll tell it like it is. In a clear, no-nonsense, concise, sarcastic way. The Angry GM has been running every sort of role-playing game you can imagine for over thirty years. And for the last decade, he’s been doling out his brand of tough-but-fair advice across the Internet. And now you can have all of his best advice in one full-color book that you can take anywhere. Even to the bathroom. We won’t tell.